The list of celebrities in the birding world is not long. But every hobby has a few nationally known standouts who are in constant demand as guest speakers. Last month I got to meet one. Better yet, I went birding with her. 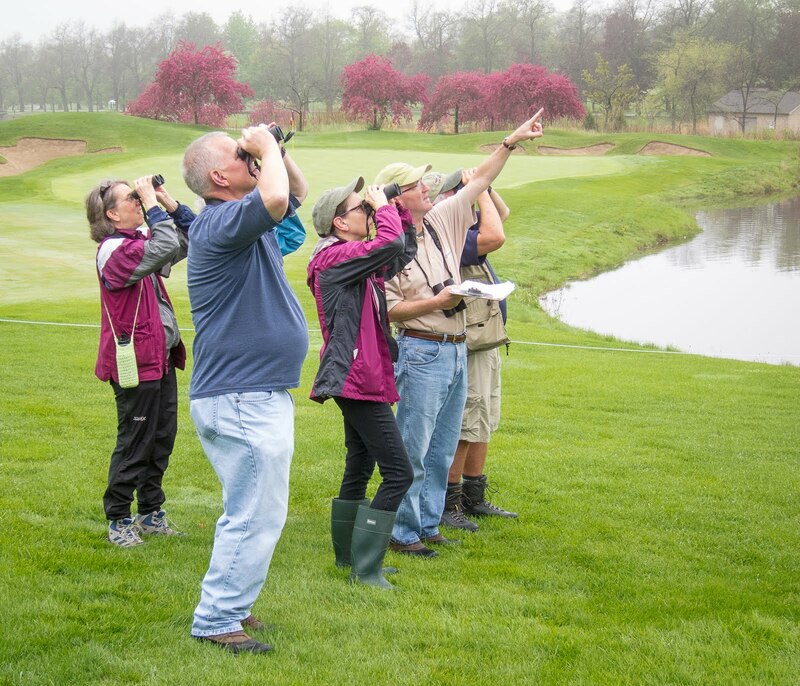 Julie Zickefoose visited Glen Ellyn as a guest of the DuPage Birding Club, flying in from rural southeast Ohio. It is there, on the farm property she shares with her husband and two children, that Julie—or “Zick” as she often calls herself—writes, sketches and paints. These talents are well showcased in Letters From Eden, her 2006 book of essays about the simple pleasures of living with nature. If the name Zickefoose rings a bell, you're probably a reader of Bird Watcher's Digest. The pint-sized magazine is a favorite among casual and serious birders alike, and Julie is married to the editor, Bill Thompson. Julie's paintings often appear on the magazine's cover and inside pages, plus she contributes the True Nature column. If you're an NPR fan, perhaps you've heard Julie on “All Things Considered,” where she's a regular guest. Julie's appearance at the bird club was a big hit. More than 100 members and guests turned out, and many of them lined up for the book signing after the presentation. A Glen Ellyn fan club was born. But what I liked most is that Julie's talk went way beyond birding. She told stories about plants and butterflies and box turtles and snakes. This speaker was all about the big picture, the nature all around us. It was good medicine for those like me who sometimes suffer from birding tunnel vision. The relentless pursuit of birds can keep us from appreciating all the other cool things that are part of their world. And our world. Zick's message was reinforced for a small group of us the next morning at the Morton Arboretum in Lisle. I knew from her presentation the night before that she'd be good company in the field. She is “down to earth,” funny and not the least bit hung up on her celebrity. I can see her laughing when she reads this. Me famous? Really? That's a good one! The first bird we found was dead. A hermit thrush had crashed into a Visitors Center window and was lying just outside the main entrance. Julie scooped it up for a close examination and the way she moved it around with her fingers made the bird seem alive. If anyone could save an injured bird it would be Zick, but it was too late for this one. At least the Field Museum could use it as a study specimen, so we set it aside until later. Fortunately the next birds we encountered had a pulse—swamp and song sparrows around Meadow Lake. No big deal, except to Zick. She worked hard at photographing them with her long-lens Canon Rebel, treating them like something special. To her, they were. This was 10 minutes into our walk, and for the next three hours Julie's enthusiasm for everything around us never waned. She stopped to photograph a fox squirrel as if she'd never seen one before. She marveled at a burning orange Chinese sumac, a tree even us locals had never before noticed. And she paused to inspect a ginkgo tree as if it were an endangered species, telling us some things about its architecture and leaf structure that we probably should have known but didn't. Good stuff, and right in front of our faces. But my favorite part of the morning was when Julie noticed a bushy tree with a lot of bird activity. She suggested that we sit down in the wet grass and just watch it. The tree, a hackberry, was full of ruby-crowned kinglets, plus a palm warbler or two. The chasing kinglets posed a photographic challenge that Zick couldn't pass up. To her credit, she actually landed a decent shot. But then all of us settled on another challenge—to actually see the namesake field mark on one of these hyperactive birds. Eventually we did spot a kinglet sporting a crimson mohawk. It was a sweet little victory on a day when little things mattered. After lunch we set out for the airport, a trip that turned into a small adventure when yours truly missed an exit. I confess to suffering the indignity of having to stop at a 7-Eleven in Elk Grove Village for directions. But Julie stayed calm as we chatted away about our kids, two of whom possess bird names. She has a Phoebe, I have a Jay. We pulled into O'Hare an hour before Julie would begin the journey back to her Eden. I'd like to think that she found a little bit of Eden here as well, in a place so different than Whipple, Ohio. We can find it too, Zick would tell us, if we just open our eyes.